Will a triangular Russia–India-China order emerge at Ufa? The BRICS and SCO summits at Ufa could see a triangular global order emerge. Creation of a new strategic order requires foreign policy pragmatism and nuanced global understanding that all the three powers – Russia, India, China – must initiate. The current global spotlight is on Ufa, the capital of the Republic of Bashkortostan in Russia. Ufa will go down in history for hosting two important summits together; the seventh BRICS summit and SCO summit; this week. The official launch of BRICS’ New Development Bank (NDB), the formal creation of the currency reserve pool under BRICS’ Contingence Reserve Arrangement (CRA), the impending expansion of SCO membership and a possible convergence of cooperation between BRICS, SCO and the Eurasian Economic Union (EEU) will all make the events at Ufa historic. A Russia-India-China triangular order is also likely to emerge at Ufa, which has the potential to alter the balance of power in the global financial architecture. 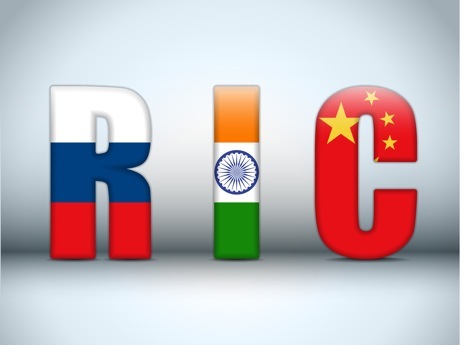 A trilateral mechanism already exists among the three neighbours, Russia, China and India, in the form of the RIC forum. The RIC meets often to discuss common issues of concern. However, RIC is basically a soft network that lacks the vigour to forge concrete understanding among the partners on key global issues. The Ufa BRICS/SCO summits offer an occasion for these three countries to rethink the RIC mechanism in terms of strengthening the trilateral order. The emphasis of this emergent order will not only be on how to increase the space and influence of the three countries, but on how to check the Western dominance in global financial decision-making. Individually, all three countries have problematic financial concerns with the Western world. Russia is currently searching for appropriate mediums and trying to overcome the financial burden that has arisen out of the Western pressure from the Ukraine crisis. India along with China is trying to increase its voting rights in the global financial institutions. India may have a greater parallel understanding with the USA on global security and strategic matters, but finds it difficult to raise its presence and influence at the IMF, the World Bank and the Asian Development Bank (ADB). China is searching for an alternative financial order, where it can lead, like the AIIB. Both the NDB and the CRA may mark the beginning of this order. The NDB is intended to provide greater financial opportunities for infrastructural developments to emerging economies and developing societies. The central motive behind the NDB and the CRA is to emerge independent of Western financial clout and have direct transactions in local currencies. With an authorised capital of $100 billion, NDB aims to emphasise on mobilising resources for infrastructural development in developing countries. The NDB founding members will share the opening subscribed capital of $50 billion among themselves. The CRA, with an opening capacity of $100 billion, is primarily intended to be utilised for overcoming short-term liquidity pressure. Direct conversion through local currencies will obviously limit and reduce the influence of the US dollar. The SCO and SCO Development Bank also can propel this movement for autonomy. The Ufa SCO summit must make a statement to witness the expansion of the SCO, with India included as a core member. In this approach, conservative politics between Russia and China, by balancing each other through India’s and Pakistan’s inclusion as SCO permanent members, must take a back seat. If this happens, it will obviously enlarge their global projection for a greater financial order, which will be favourable to their global political presence and rise. True, Russia, India and China do have a huge level of strategic misunderstanding and lack mutual trust. But conservative thinking in foreign relations practice has little space in twenty-first century multilateral politics. The enlargement of SCO, with the inclusion of India, offers a great opportunity for the beginning of an alternative global order. It provides an occasion to strengthen understanding among these three powers on matters like terrorism, climate change, energy and a range of governance matters that are political and security oriented. Dialogue on these matters will augment and boost greater financial understanding. This reorientation can begin with the establishment of the SCO Development Bank. To make a better impact, the SCO Development Bank should not be limited in its scope to address the concerns and interests of the Central Asian region or SCO members only. There is direct conversion in local currencies between China and Russia in the border areas, but this practice must be implemented widely among SCO members. China has been the main architect of the SCO along with Russia. But the time has come to increase not only the mandate of the SCO including its membership, but also to create the SCO Development Bank which must look after the financial concerns, interests and stability in Central Asia and the South Asian region. Besides, the SCO Development Bank must be open and inclusive in cooperating its working mechanism with the NDB and Asian Infrastructure Investment Bank (AIIB). The Russians are taking pride in hosting the BRICS and SCO summits together, and have organised a parallel cooperative meeting among the leaders of BRICS, SCO and EEU. To promote a Russia-India-China triangular order, the bilateral understanding among the three countries is undoubtedly important. Russia and China have improved their mutual understanding in the recent past. The USA ‘pivot’ to Asia (seen as being antagonistic to China) and the increased Western antagonism towards Russia have brought the two countries closer, but this relationship is yet to be stabilised fully. A great level of mistrust still exists between the two. Meanwhile, India-China relations are marked by a range of conflict, cooperation and competition elements. A greater India-China understanding for a non-Western order, addressing a range of regional and global financial matters, is a common forte that must bring these two economies together. Likewise, India-Russia relations must be upgraded from their usual standing of being pleasant to each other. Given the traditional bonding and depth of India and the Soviet world, relations with Russia must merit the first choice for India. Russia on its part must accept India on a pragmatic note that even though India has a strategic understanding with the USA, it is purely based on India’s national interest, and not intended against Russia. In return, India must start appreciating Russia and its revival as a power in global politics. The Ufa BRICS/SCO summits may witness the beginning of this triangular strategic order. The front face of this new order may be the creation of the NDB and the formal establishment of the CRA under BRICS. The announcement of the SCO Development Bank may also add value to this anticipation. Dr. Jagannath Panda is Research Fellow and heads the East Asia Centre at the Institute for Defence Studies and Analyses (IDSA), New Delhi.